M&G group offer the ultimate wall and roof terminals for domestic and small commercial high efficiency boilers. With years of experience, the specialists at M&G have the expertise and know-how to advise the correct Wall and Roof terminal according to the strict guidelines of each country. There are two high quality flue systems available: the Twinline single PP-flue system and the Coaxline concentric flue system. Twinline is a safe and robust PP-flue system for high efficiency boilers. It is easy to connect, easy to adjust and sustainable. The PP pipes are light-weight, easy to install and fit together perfectly. The high quality moulding parts ensures a minimum on resistance and is completely recyclable at the end of its life-cycle. Coaxline has all the advantages of Twinline, with the added technical and aesthetic advantages of a powder coated concentric flue system. 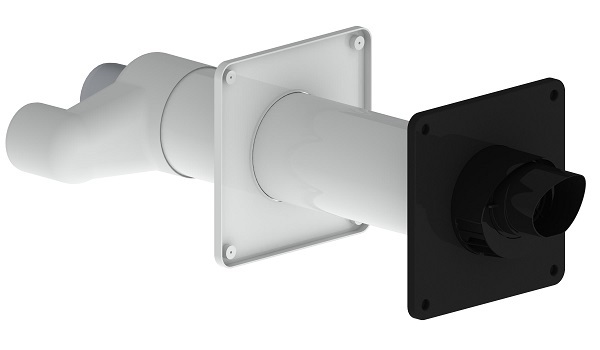 There are two Coaxline versions available: Coaxline Standard system with a push fit connection and Coaxline Plus system with a locking clamp connection. Both systems are CE & ULC approved. M&G is not satisfied with just meeting these required standards. Their aim is to deliver even higher quality. In fact, it has been scientifically proven that M&G products perform five times better in terms of the ‘ageing standard’ compared to what the standard actually requires. Innovatively they are able to adapt these synthetic materials to have much greater durability. M&G ensures the systems stay free of condensation, ice and recirculation. This guarantees that the flue gas does not re-enter the boiler or recirculates into the air inlet. M&G is also an expert in advising on the location to install the roof and wall terminal according to the right standards. Every important feature is taken into account and the high-quality products have been designed to fulfil the needs and demands of each individual client. Twinline and Coaxline are the ultimate solution for anyone in the market for a wall and roof terminal.